I received a set of Christmas cookie cutters a few years back from my ex-colleague but have never gotten the chance to use it until now… oops! 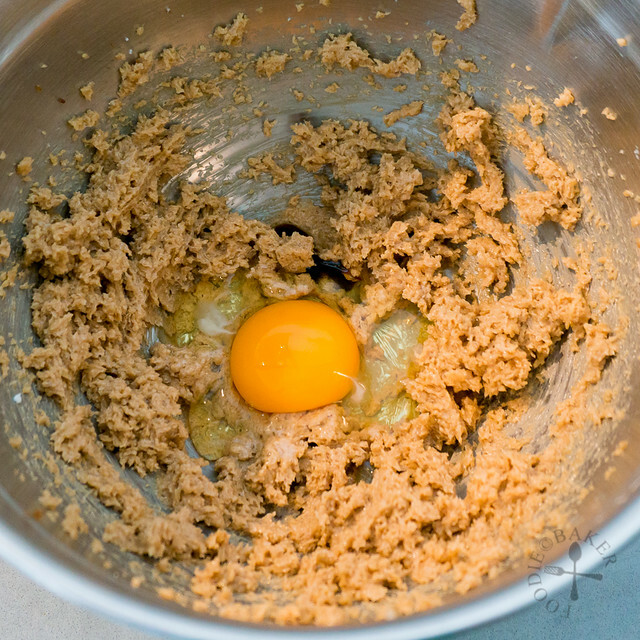 The cookie dough recipe is from one of my favourite cooks, Nigella Lawson. I have always loved the way she cooks and bakes her way into the kitchen, and all the food she made always look so delicious! The cookie dough is pretty easy to assemble though I find that it softens quite easily, so I chilled the dough after rolling but before cutting the shapes out. Rolling them out between two sheets of clingfilm eliminates any use of additional flour which may make the cookie tough, prevents the dough from sticking to the table counter and makes it easier to transfer the cookie dough to the baking sheet. Decorating cookies have never been something I like to do because it requires quite a high amount of patience, which I seriously lack. So I opted for a simple cookie design in which all can be done in one day without having to wait for the base layer (the green frosting) to dry. And as you can probably tell, I got lazy of decorating halfway and just used melted chocolate to pipe some funny designs all over. I’m sure all of you can do a better job than me! The cookies aren’t too sweet themselves so the royal icing on top did not make an overly sweet cookie. But I still very much prefer the one with the chocolate piping on top (who doesn’t like chocolate?!) These cookies are best served or packed the next day so that the royal icing and chocolate has ample time to dry up – they make such a delicious and pretty Christmas gifts! And here’s how to make them! 1) Beat butter and sugars with an electric mixer on medium to medium-high speed until mixture is creamy 2) Add in egg and vanilla and beat until combined. 5) Pat the dough out into a disc of about 1-inch thick. Wrap up the dough with the clingfilm and chill in the refrigerator for at least 1 hour. 6) Use a rolling pin or a wine glass bottle and roll out the dough until it’s 5-mm (1/4-inch) thick. 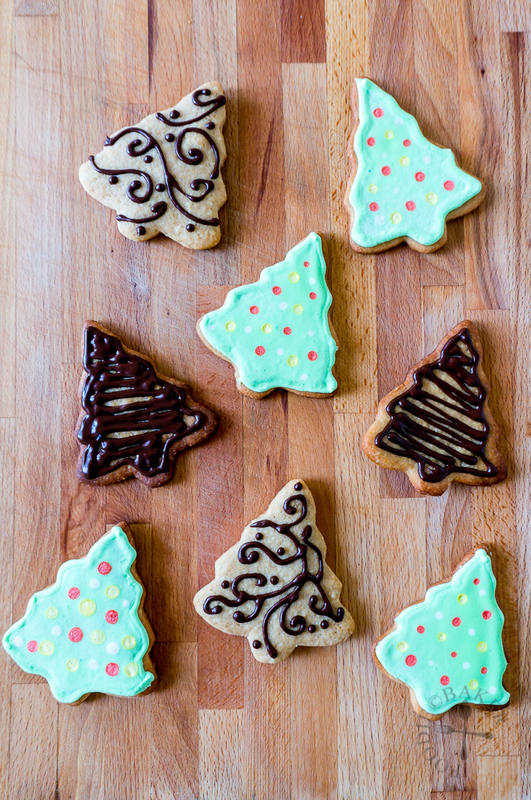 7) Dip a cookie cutter into flour and cut out a cookie shape, then transfer it onto the baking sheet and bake away! 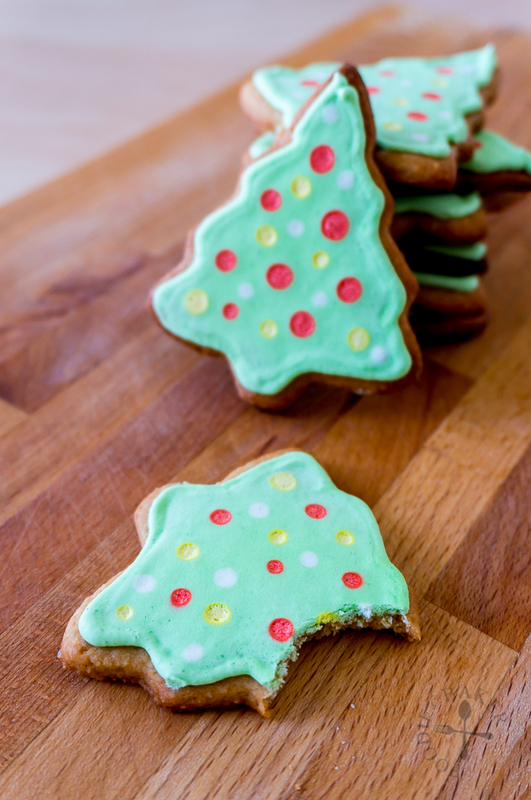 Once the cookies have cooled completely, unleash your creativity and decorate away! 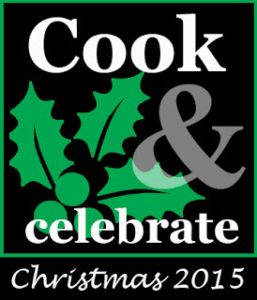 This post is linked at Cook and Celebrate: Christmas 2015 hosted by Yen from GoodyFoodies, Diana fromThe Domestic Goddess Wannabe and Zoe from Bake for Happy Kids. 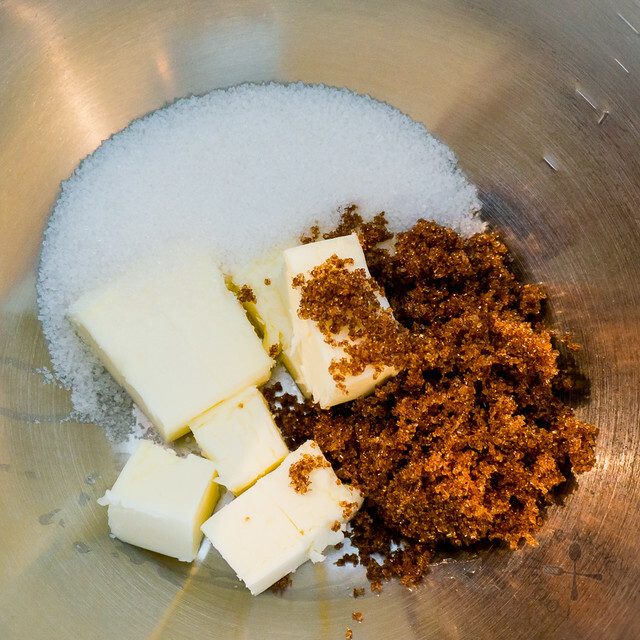 Place butter and sugars in a large mixing bowl. Beat with an electric mixer on medium to medium-high speed until mixture is creamy, scrapping down the sides of the bowl with a rubber spatula occasionally, about 5 to 7 minutes. Add in egg and vanilla and beat on medium speed for 1 minute until combined. 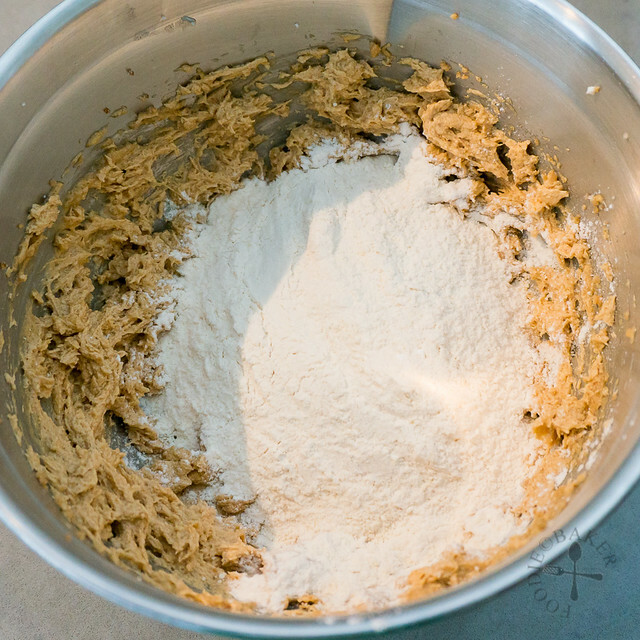 Add in flour, ground almond, baking powder and salt and beat on low speed until just combined. Alternatively, use a rubber spatula and stir until the cookie dough comes together. 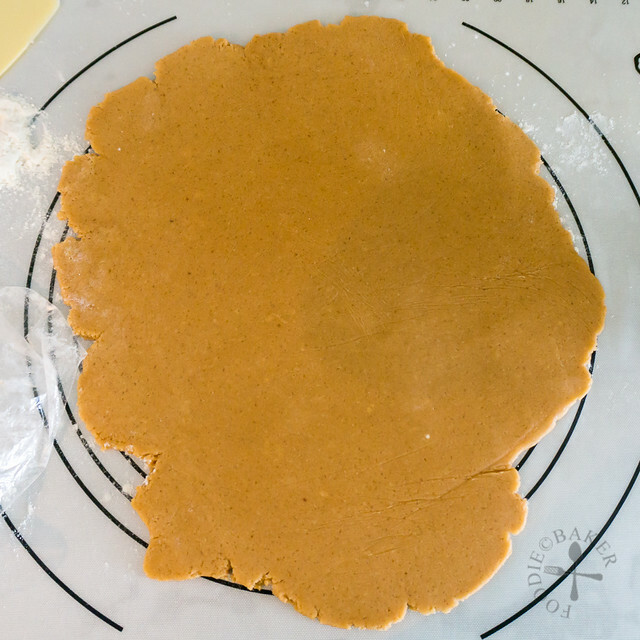 Scoop out the dough onto a large piece of clingfilm and pat it out into a disc of about 1-inch thick. Wrap up the dough with the clingfilm and chill in the refrigerator for at least 1 hour. Preheat the oven to 180C / 355F. Line a baking sheet with baking parchment. Unwrap the dough and place it on a large piece of clingfilm. Place the clingfilm used to wrap the dough on top of the dough to prevent sticking. 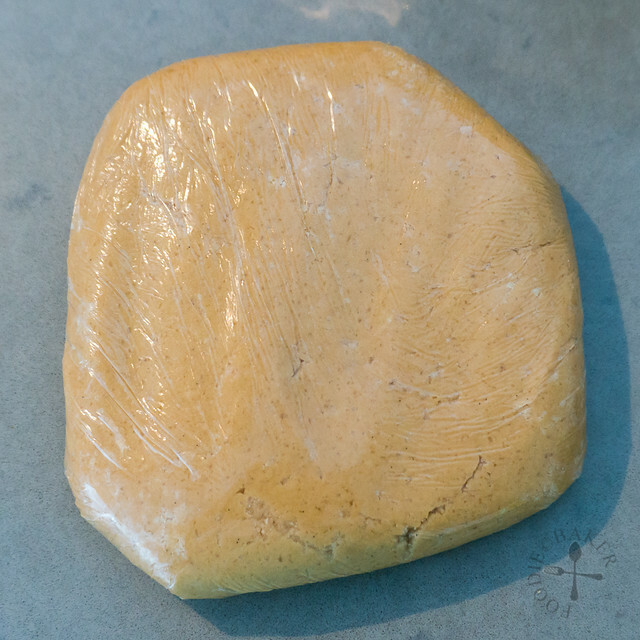 Use a rolling pin or a wine glass bottle and roll out the dough until it's 5-mm (1/4-inch) thick. If the dough feels too soft, chill it in the refrigerator for another 15 minutes before cutting the shapes out. 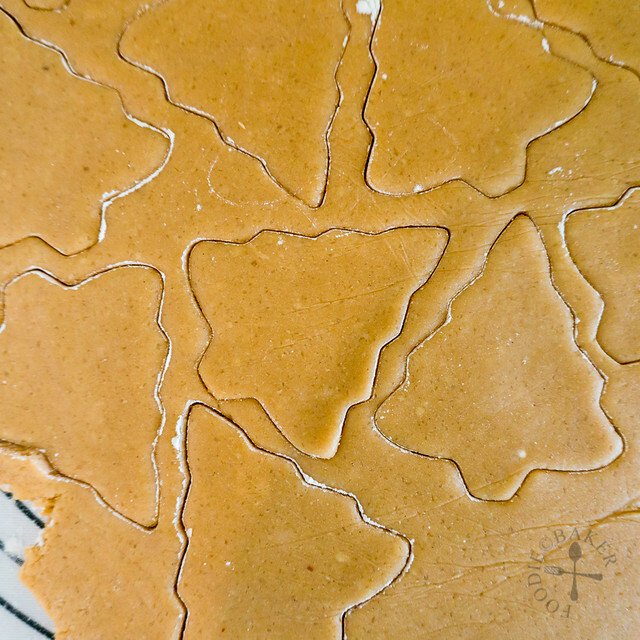 Dip a cookie cutter into flour and cut out a cookie shape, then transfer it onto the baking sheet. Repeat, combining and rolling out the scraps, until all the cookie dough has been used up. 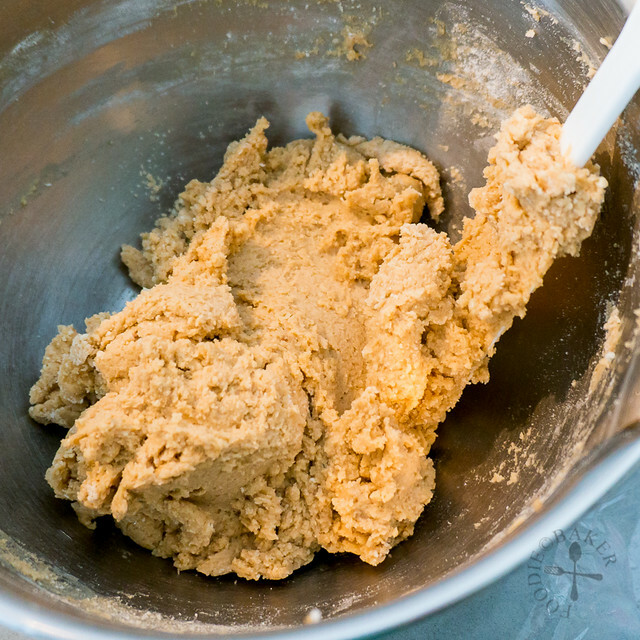 If the dough is becoming too sticky, chill it again before using. Bake the cookies for 10 to 12 minutes until lightly golden around the edges. Cool the cookies for 3 minutes on the baking sheet, then transfer to a rack to cool completely. 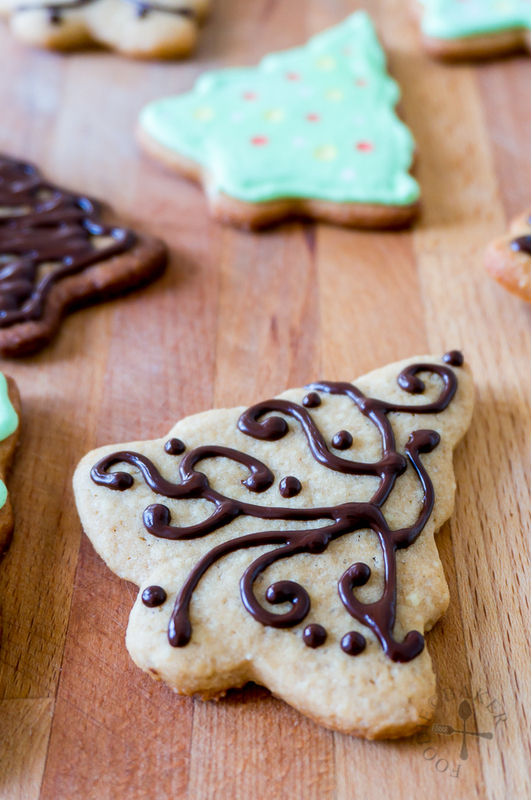 Once the cookies have cooled completely, decorate the with royal icing or melted chocolate. 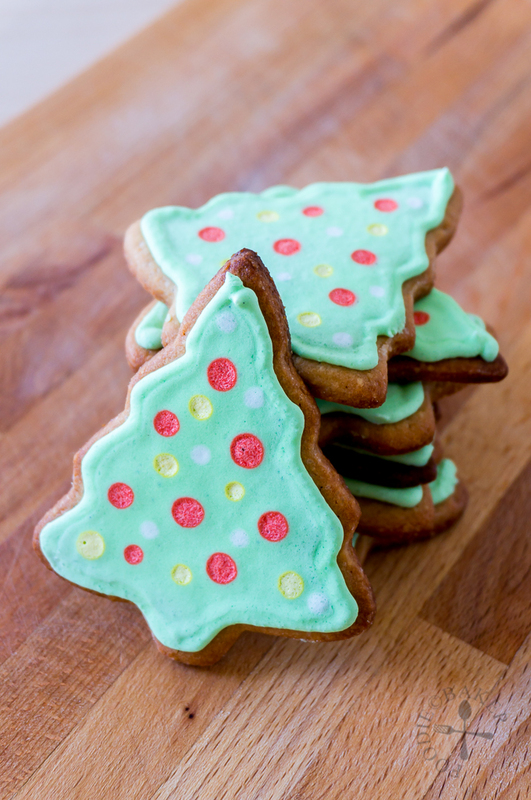 - To decorate the Christmas Tree Cookies with royal icing like I did: Pipe a green border icing around the cookie and flood it with green icing. Set aside for 5 to 10 minutes so that green icing set slightly (if you do not let it set slightly, the other colours will bleed into the green icing). Pipe in small dots of red, blue, yellow, white (or any other colours) into the green icing to mimic the Christmas ball ornaments. - It's best to set the royal icing / chocolate overnight before storing them in cookie jars or wrapping them up in small gift bags. Beautiful!! I so want to try baking these for my kids! Thanks for sharing! 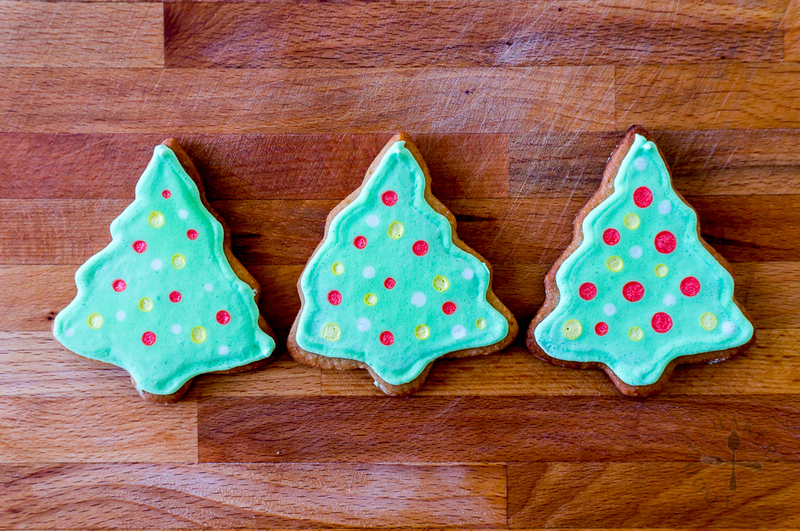 You did such a fantastic job at decorating these adorable cookies! I love the chocolate squiggles especially 🙂 I’m getting ready to start baking! Beautiful cookies! I have no patience for decorating either—but you did a marvelous job!!! Jasline: What gorgeous cookies! These are great to make any day, and its pipping or decoration makes a great project for moms and their children. Wishing you a very Merry Christmas! You might not enjoy decorating cookies, but you sure did a great job. These look fantastic! I love the piped swirls! They are so adorable and festive, Jasline. Not just a great photographer, a good cook you are also have that artistic talent. These are cute! Wouldn’t be Christmas without nicely decorated cookies. Yours, Jasline, would be the stars of any cookie platter. Jasline ! Yours cookies look absolutely beautiful!!!! Love them! I’m here to grab a few of your lovely decorated Christmas tree cookies to hang on my Christmas wreath ^-^! 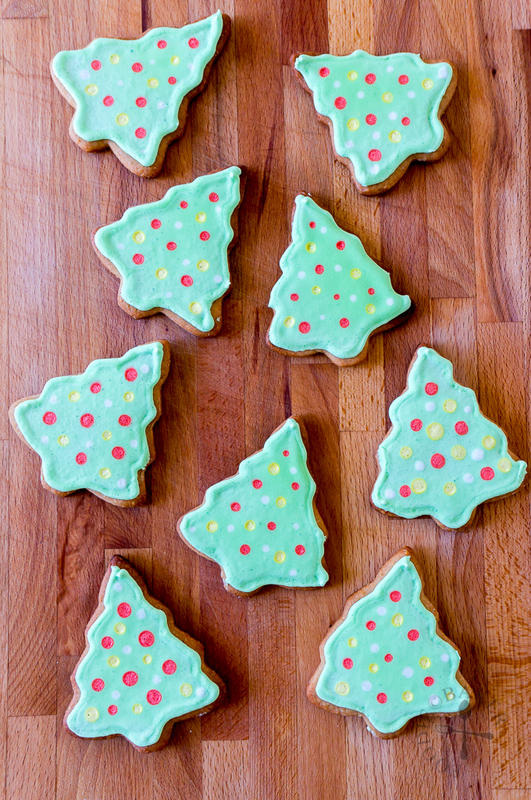 Adore these wonderfully-decorated Christmas cookies, Jasline. You did a great job. I love Nigella so I know it’s got to be a good recipe and I’m with you on simple designs. Yours came out great. I started decorating my sugar cookies with chocolate last year instead of all icing and I love it. These would make wonderful gifts or part of a big cookie platter.